One of the great things in Spain is that when you go to have a drink in a bar you often get an ‘accompaniment’ to munch on. This is the pica-pica. It’s usually consists of olives or these yellow things that look like giant corn. We tasted the ‘giant corn’ first time when we were invited for dinner to our Spanish friends’ place. We were told to bite it in half and spit out the skin. We tried them and really liked them so we asked for its name. Our host, Juan Ramón, looked slightly embarrassed then quickly rushed out to the kitchen. We found this curious but let it drop however on the next day I asked my native Spanish teacher to tell me the yellow thing´s name. Apparently they have an ´official´ name but everybody calls them chochitos. She launched into explaining the origin of the name and I just got redder and redder in the face while I was listening then just burst out laughing! These Spanish are so crazy! If you want to know what it means then I’m afraid you have to do the research. 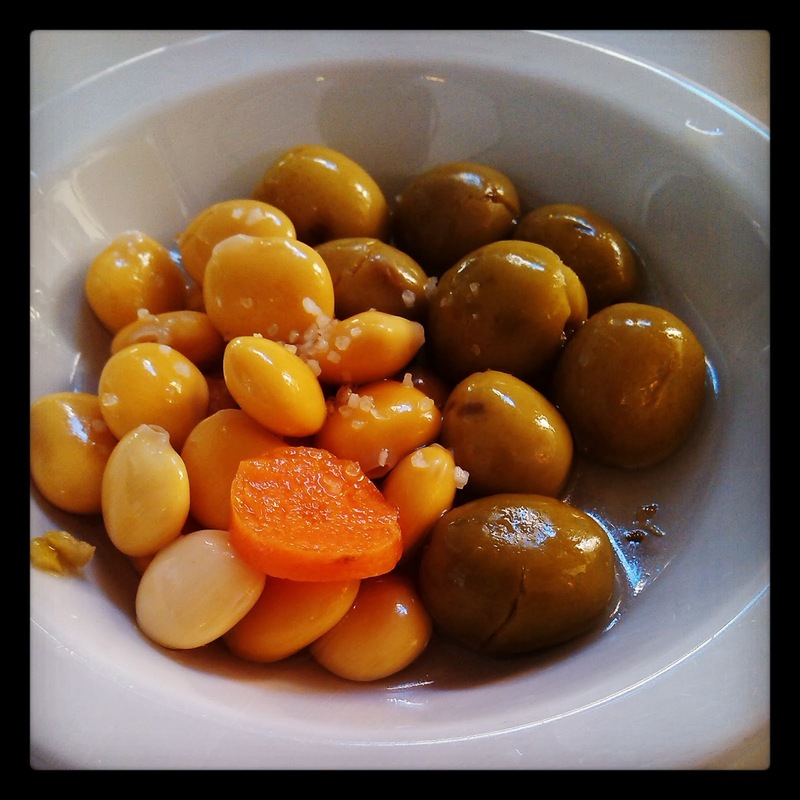 We have been buying our olives from the shop but it was never really as tasty as in some of the bars. Finally together with the sun the olive sellers came out to the streets as well. One day we built up our courage and walked down to the one closest to us. The stall is on a corner of a busy street shaded by an orange tree and seems to have a constant stream of customers. We stood in line and waited for our turn. Without asking the man handed us a few olives to try from the different buckets and pointed at little plastic bag that was placed on the side thoughtfully for the seeds. We tried three different types then settled on one. We also got some chochitos as well. Since then we have become part of the group of his faithful customers. Thanks for this wonderful blog. Chochos or chochitos are apparently the same as lupini beans.